The Best Laid Plans of Mice and Men: What Happens When a Robbery Accomplice Goes Rogue? Davis v. State is a case about two robberies— one a planned robbery of a convenience store, and the other of the customer inside the convenience store, a spur of the moment decision. 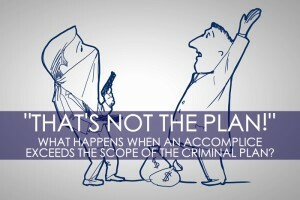 What happens when accomplices to a well-planned robbery go “rogue” and commit additional crimes that are not part of the original plan? Who is on the hook for their actions? Desmond Davis and two accomplices planned to rob a convenience store at night. Around 9:30pm, Davis entered the store alone and chatted with a customer. Moments later, two accomplices entered the store, pointing loaded guns at the cashier and the customer. The accomplices decided to rob the customer first, despite Davis’s instructions not to do so, “we just [came] for the store.” Davis jumped over the cash register and took money from the cash drawer. The customer dropped his cash to the floor and ran to the store’s restroom, locking the door behind him. The gunmen fled with the cash from the store and from the customer. Once the coast was clear, the store employee called 911 and locked the doors. The entire robbery was captured on a security camera. The three robbers split all of the cash among themselves after the robbery. Shortly after Davis’s arrest, police obtained a confession after the detective told Davis, more or less, that not only could his confession be used for or against him, but that it could be used for or against him at trial. During the interrogation, the detective asked Davis to “man up” and give his side of the story, admitting his own guilt. Davis eventually made a written statement to law enforcement, admitting to his role in planning and carrying out the robbery. The interrogation and confession were captured on video. At trial, the jury convicted Davis on two counts of aggravated robbery with a deadly weapon—one count for the convenience store and one count for the customer. Davis was assessed a punishment of 30 years (for one count) and 15 years (for the other count) and a $1,000.00 fine for each count. On appeal, Davis argued that his instructions to the accomplices not to rob the customer defeated the theft element of that robbery and thus, the record is insufficient to show his participation in the aggravated robbery of the customer specifically. Further, Davis argues that his confession was obtained under duress, in violation of the Texas Code of Criminal Procedure. The issue before the Second Court of Appeals was to determine whether, in addition to the robbery of the store, Davis also participated in the robbery of the customer, and, whether Davis’s written confession obtained by police violated section 38.22 of the Texas Code of Criminal Procedure. Robbery is an assaultive offense, where the assaultive conduct is the essence of the crime, not the theft in and of itself. Ex Parte Hawkins, 6 S.W.3d 554, 560 (Tex. Crim. App. 1999). In robbery prosecutions, the number of persons assaulted is at issue, not the number of thefts in one crime episode. Id. When law enforcement securing a defendant’s written confession tells the defendant that the confession “could be used for or against him in court” or “for and against him in court” and that “they might go easy on him if he confessed,” the written confession becomes inadmissible because it violates section 38.22 of the Texas Code of Criminal Procedure. Sterling v. State, 800 S. W.2d, 513, 518-519 (Tex. Crim. App. 1990). Section 38.22 of the Code deals with admissibility of written confessions in court. Here, the robbers intended on stealing the money from the cash register when two of the gunmen pointed their weapons at an innocent customer and stole his money. Based on this alone, the Court says, the evidence is sufficient to support the jury’s determination “that [Davis] intended to steal the store’s money and that the [accomplices] threatened the customer while they were stealing money from the [store].” Further Davis and the accomplices shared all of the money stolen in that crime episode—there was no effort made to distribute the customer’s money to only the two accomplices. Davis participated in the store robbery. Even though he told his accomplices to not rob the customer, Davis still placed the customer in fear by waving firearms and by jumping over the counter to steal money out of the register. Additionally, after the Court reviewed the interrogation tape, the Court “determined that the “officer told [Davis] that he had an opportunity to tell his side of the story and that he could be a man by admitting his guilt.” The officer never suggested to Davis that he would be helping his court case by admitting his guilt. The confession was, therefore, not obtained in violated of Section 38.22 of the Texas Code of Criminal Procedure. The Texas Court of Criminal Appeals released an opinion this month in a case where a man entered a convenience store brandishing a rifle. When the man looked around, however, he noticed that there wasn’t anyone in the store. The store clerk was in the back office watching the man on the security camera. When the clerk saw the man enter the store, he locked the office and called 911. Unable to open the cash register, the “robber” stole the clerk’s wallet and some money that was behind the counter. 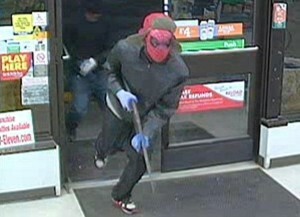 The “robber” never saw anyone inside the store. Then he left. a person commits [robbery] if, in the course committing theft…and with intent to obtain or maintain control of the property, he intentionally or knowingly threatens or places another in fear of imminent bodily injury or harm. Does the Offense of Aggravated Robbery Require Interaction Between the Accused and the Purported Victim? ‘knowingly’ does not refer to the defendant’s knowledge of the actual results of his actions, but knowledge of what results his actions are reasonably certain to cause. Using this definition, robbery-by-placing-in-fear does not require that a defendant know that he actually places someone in fear, or know whom he actually places in fear. Rather, it requires that the defendant is aware that his conduct is reasonably certain to place someone in fear, and that someone is actually placed in fear. In this case, because Appellant brandished the rifle in the convenience store, the CCA held that his culpable mental state was not negated by the fact that the victim did not happen to be in his presence. In sum, the CCA answered the question presented in the negative. The offense of Aggravated Robbery does NOT require interaction between the accused and the purported victim. Read the full CCA opinion in Howard v. State.